Cooked a 16 pound turkey on the Weber rotisserie on the Weber 22" cooker. Turkey came out great but it was done early due to the cooker running in the 450 to 475 range. added 10 briquets to each basket temp ran between 450 - 475. After 1 hour put only 5 briquets on each side and the turkey was almost done. I had the bottom vent all the way open and after the first hour closed the top vent to 1/2 way open but it still ran in the 450 - 475 range. Too much air coming from the bottom vent. You can easily control temperature by adjusting the bottom vent regardless of how much coal you're using. Next time try closing the bottom vents halfway. If still too high go for 3/4 closed but never totally closed. How long were you planning? Mine usually take 2.5-3 hours. They don’t take that long. I was thinking for 16 pounds 3.5 hours, so what position on the top vent if the bottom is 1/2 open? I would say you started with wayyyyy to many briquettes. 30 to many to be exact. 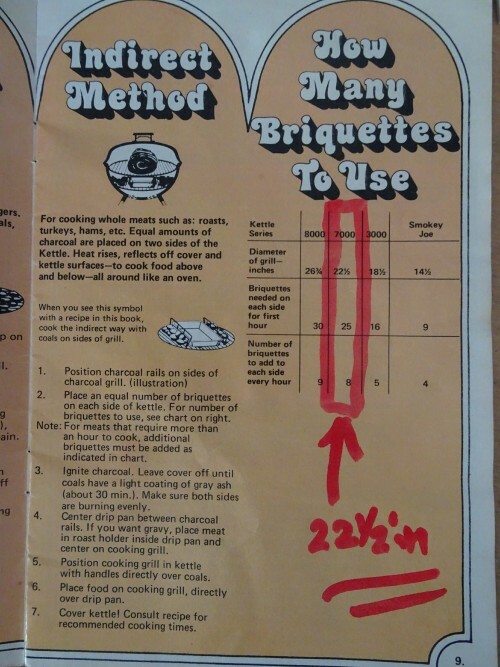 This is a photo of my 1980's Weber kettle owners manual. 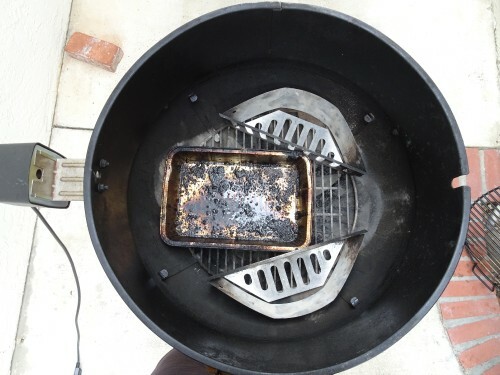 It has the recommended amounts of briquettes per Weber to be used on each side when cooking indirect. It has a break down for SJ, 18", 22" and 26". The 22" is highlighted as it was the only size I owned back then. I have always just followed this guide and start with 50 briquettes (25 per side) when cooking indirect or using the rotisserie. I then add 8 briquettes per hour to each side. I run my lid and bowl vents wide open when using the rotisserie. There is so much air gap when using a rotisserie, I don't believe adjusting the vents make much difference. My lid therm usually runs at 350-375 degrees. In this same owners manual, Weber says to figure 11 minutes per pound cooking a turkey. A 16 lb bird should take around 175 minutes (roughly 3 hours). The other trick I use is to set my charcoal baskets more to one side of the kettle and put the bird on with the legs facing the charcoal. This moves the breast meat further from the coals. The dark meat (legs and thighs) require a higher temp (175-190 degrees) to be done and can tolerate being closer to the heat. The turkey should be pulled when the breast meat reaches 157 degrees. These are the recommended temps from the Thermapen website.